RSV can cause upper respiratory infections (such as colds) and lower respiratory tract infections such as bronchiolitis and pneumonia. Symptoms progress from sniffles to wheezes, sometimes in a matter of hours. RSV is spread by droplets. Infants and children infected with RSV usually show symptoms within 4 to 6 days of infection. Most will recover in 1 to 2 weeks. However, even after recovery, very young infants and children with weakened immune systems can continue to spread the virus for 1 to 3 weeks. Pediatricians have a rapid nasal swab test in their offices. While this is "uncomfortable" for the child, the results can give both Doctor and Parents peace of mind. Respiratory syncytial virus (RSV) is common during fall, winter and spring. It usually causes mild, cold-like symptoms. 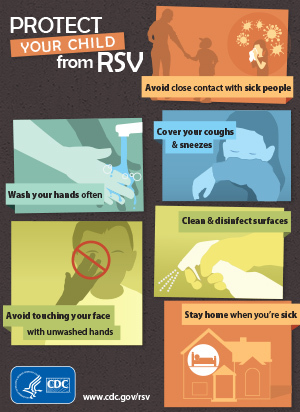 But RSV can be serious, especially for infants and older adults. Help protect your child and others from RSV. People of any age can get another RSV infection, but infections later in life are generally less severe. Premature infants, children younger than 2 years of age with congenital heart or chronic lung disease, and children with compromised (weakened) immune systems due to a medical condition or medical treatment are at highest risk for severe disease. Adults with compromised immune systems and those 65 and older are also at increased risk of severe disease. In the United States and other areas with similar climates, RSV infections generally occur during fall, winter, and spring. The timing and severity of RSV circulation in a given community can vary from year to year.